Nose Graze — Young Adult book reviews2.5 StarsAlthough False Sight and I didn't start or end on the best note, I really like the direction the series has taken. At the beginning, I just wasn't that into the story. I don't even have a real reason, it was just an inexplicable lack of interest. Then, around the 45% mark, things picked up a bit!I'm hesitant to discuss what exactly happened around the 45% mark because it might be spoilery, so I'll put it in spoiler tags and you can decide for yourself if you want to read it. I'm not giving away anything from the ending, just talking about something that gets revealed at the half-way point.False Sight introduces us to a whole element: parallel universes. I honestly didn't expect this AT ALL, and it was kind of a cool surprise! Apparently the "originals" are from another world called "True Earth" and they're trying to prevent the other universes from getting too advanced. I ADORE books with parallel universes so this was such an awesome element to the story. It finally piqued my interest and really got me invested in what was going on!However, as time went on, I had two other problems with the book:First, Miranda began to really annoy me with her whole "I'm going to do absolutely everything myself" attitude. She wouldn't include her friends on what was going on and she insisted on doing everything herself. I hate this kind of attitude. I just don't like it when people refuse to accept help or acknowledge that other people can be useful. It's that annoying "But I need to protect everyone and take all the risks myself" mentality.And secondly, my interest started to wane again towards the end. To be fair, I don't think it was entirely False Sight's fault. For a lot of the book, my heart wasn't entirely in it, mainly because I really felt like reading a different book (not necessarily because False Sight was bad). 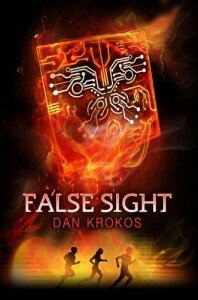 So I kept thinking about that other book I wanted to read, but I was still reading False Sight, but only half heartedly.Overall, I don't think that False Sight was a bad book by any means. I don't think it was as good as False Memory, but I think most of my lack of enthusiasm for False Sight was due to me reading it at the wrong time when I wasn't entirely in the mood for it.If you read and loved False Memory then I do highly recommend that you continue with False Sight. Just don't make the same mistake I did and make sure you're really in the mood for it first!